Today, our Greatest Ever Socceroo announced that he’ll be hanging up his magical forehead for good. For all of us, Tim Cahill was the paternal alpha Socceroo. As long as he was anywhere near us, we’d feel safe. He reflected how easy it was when things were easy, and how hard they were when they weren’t. The trail of assaulted corner flags marked the correct path, all we had to do is follow him. We should accept today for what it is. It’s a death at the very top of the family. It was coming, and we all knew it. Age had diseased our assumptive version of him, but we still saw flickers of that person who looked after us, so it forced us to ignore the truth. The end would be near, and qualification would be his final gift to us. As today is the funeral proper, we’re just reaching for words. We won’t really be able to articulate the loss until we’re forced to play without him and suddenly be responsible for the problems we’ve got ourselves in. The death of the father (or father-figure) is something that we all face. It is a moment of unquestioned adulthood, a glacial shift of responsibility. Since 2006, we’ve shirked that, forever deferring to Cahill, and for his sins, he delivered. 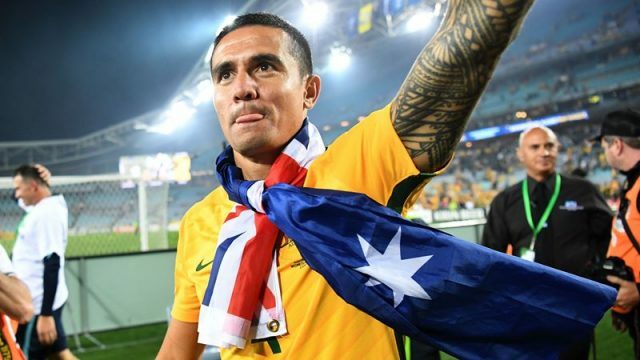 As we touched on during the World Cup, Tim Cahill was part of our entitlement. He was our green and golden parachute. We expected the world, and he laboured to give it to us. Under Cahill, we were all spoiled. His style of parenting is the reason why we’re all trolls today. We’re kept in a state of arrested development. We expect our victory meals brought to us, and we expect our dad to sort out those who are bigger than us. So, today, we should honour the man. We should share the experiences and the wisdom he granted us. Shed a tear if we must, pop a Weetbix if that dulls the pain. Maybe we should all #PutOurYourForeheads. However, on the way back from the cemetery, we need to reflect on this new world we’re now responsible for. We can cherish our father’s famous armchair, forever keeping it in its place in the loungeroom, or we can put it out on the council strip. From now on, we have a choice. With the childhood home of our football demolished, we can remain prisoners of our experience, or we can grow. As someone once wrote: “Families are always rising and falling…”, it’s now on us to build on what he left, or sink further into it.